The D.C. Weirdo Show hosts “Weirdos for Life: A Benefit for Trans Lifeline” at the Bier Baron Tavern (1523 22nd St., N.W.) tonight at 9 p.m. The showcase is in honor of National Suicide Prevention Month. Dr. Torcher and Phoenix King host the show. Rin will perform belly dance, Coryn Rose will perform aerial Lyra and spoken word, Phoenix King will perform drag, Dr. Torcher will do fire manipulation, Leigh Crenshaw will do stand-up comedy, Ricky Rose will perform in drag and Carlita Client will do performance art. The showcase will be interpreted in ASL by Billy Sanders. Tickets are $16 in advance or $20 at the door. VIP party of four table is $83 in advance. Proceeds will benefit Trans Lifeline, a peer-support hotline staffed by transgender people to aid transgender people. For more information, visit dcweirdoshow.com. Elton John performs at Capital One Arena (601 F St., N.W.) tonight at 8 p.m. “The Farewell Yellow Brick Road Tour” will be John’s final tour before retirement. John will also perform on Saturday at 8 p.m. Tickets range from $171-249. For more details, visit ticketmaster.com. Women in Their 20s and 30s, a social discussion group for LBT and all women interested in women, meets tonight at the D.C. Center (2000 14th St., N.W.) from 8-9:30 p.m. For details, visit thedccenter.org. The Glossary D.C. Support Group is at the D.C. Center (2000 14th St., N.W.) today from noon-2 p.m. The group is specifically for people of color who identify as masculine of center, non-binary or trans-masculine. Discussion will include family dynamics, cultural understanding and more. For details, visit thedccenter.org. UrbanArias presents “The Last American Hammer” at the Atlas Performing Arts Center (1333 H St., N.E.) tonight at 8 p.m. The opera follows a conspiracy theorist YouTuber waiting for the FBI in the basement of a Toby Jug Museum. Elizabeth Futral, Timothy Mix and Briana Elsye Hunter star. The libretto is by Matt Boresi. Peter Hilliard composed the music. General admission tickets are $45. Student tickets are $25. Performances run through Sept. 29. For more details, visit urbanarias.org. “Throwing Shade Live: There’s No Place Like Condo Tour” is at the Kennedy Center (2700 F St., N.W.) tonight at 7 p.m. Out comedian Bryan Safi and comedian Erin Gibson will give their humorous take on LGBT issues, women’s issues and pop culture. Special guest Shannon Watts of Moms Demand Action will join the show. There will also be singing, dancing, games and more. Tickets are $29. For more details, visit kennedy-center.org. The D.C. Eagle (3701 Benning Rd., N.E.) hosts Club Picture Day tonight from 8-11 p.m. Individuals and groups are invited to get their photos professionally taken. There is a suggested $5 donation per processed photo. On-site prints are $10. Proceeds benefit Mary’s House. Participants can reserve a 30-minute time slot by emailing gojohnego1@gmail.com or just arrive. For more information, visit facebook.com/eagledc. 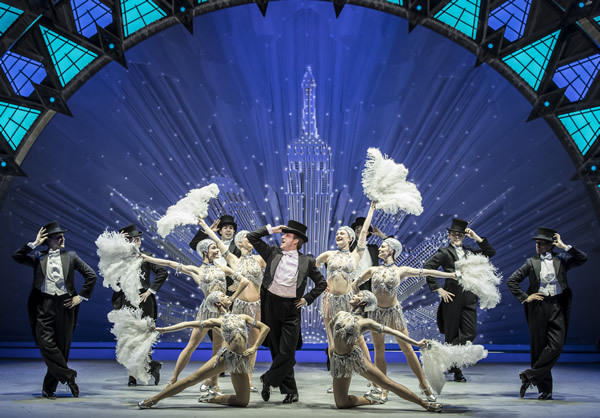 “An American in Paris: The Musical,” a filmed screening of the Broadway musical’s West End run, hits theaters for a one-day engagement today. Directed by Christopher Wheeldon, the musical stars Robert Fairchild, Leanne Cope and Haydn Oakley. For a complete list of theaters and ticket prices, visit anamericaninpariscinema.com. Nellie’s Sports Bar (900 U St., N.W.) has a drag brunch today with shows at 10:30 a.m. and 1 p.m. Drag entertainers will perform as Lady Gaga, Beyonce, Pink and more. Tickets are $41.91 and include an all-you-can-eat buffet and one mimosa or bloody Mary. For more details, visit nelliessportsbar.com. The D.C. Center (2000 14th St., N.W.) holds Foster Parent and Adoption Information Night tonight at 6:30 p.m. There will be presentations by LGBT foster parents and representatives of the Latin American Youth Center Child Placement Programs. All are welcome. RSVPs are encouraged. For more information, visit thedccenter.org. The Gay Men’s Health Collaborative has free HIV testing and STI screening at the Alexandria Health Department (4480 King St., Alexandria, Va.) today from 5-6:30 p.m. For more details, text 571-214-9617 or email james.leslie@inova.org. Overeaters Anonymous hosts a meeting specifically for LGBT individuals at St. George’s Episcopal Church (915 Oakland Ave., Arlington, Va.) tonight at 7 p.m. Newcomers welcome. For more information, call 703-521-1999 or email liveandletliveoa@gmail.com. The Health Working Group holds its September meeting at the D.C. Center (2000 14th St., N.W.) this evening at 6:30 p.m. The group will discuss the new OSSE Fact Sheet on Suicide and Youth in the District and the work of partner organizations to prevent suicide. For more details, visit thedccneter.org. The D.C. Eagle (3701 Benning Rd., N.E.) hosts its Pong’d Tournament, a beer pong tournament, tonight at 7 p.m. Teams with two-five members will compete. Beer will be provided for the game. There will also be drink specials before and after the game. For more information, visit facebook.com/eagledc. D.C. Frontrunners meet at the Shevchenko Memorial (23rd and P St., N.W.) tonight at 7 p.m. The running route will be along one of their Potomac River routes. Afterwards, the group will eat at a local restaurant or outdoors in front of the Dupont Circle fountain. For more details, visit dcfrontrunners.org. AGLA meets at Buzz (818 N. Quincy St., Arlington, Va.) for a coffee social tonight at 7 p.m. The coordinator will be wearing purple and gold Mardi Gras beads for members to recognize. All are welcome. For more information, visit agla.org.